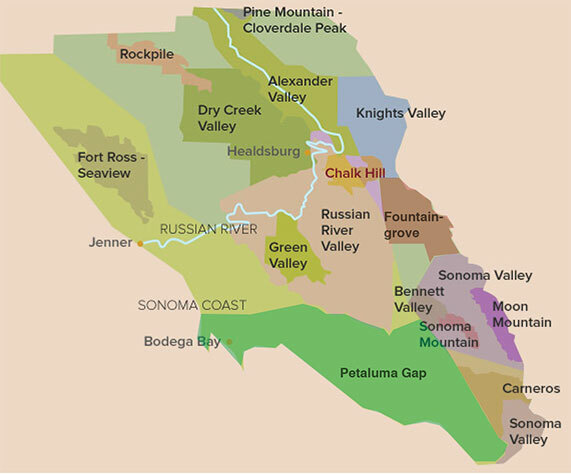 The Russian River Valley climate is sculpted by the regular intrusion of cooling fog from the Pacific Ocean a few miles to the west. Much like the tide, it ebbs and flows through the Petaluma Wind Gap and the channel cut by the Russian River through the coastal hills. The fog usually arrives in the evening, often dropping the temperature 35 to 40 degrees from its daytime high, and retreats to the ocean the following morning. This natural air-conditioning allows the grapes to develop full flavor maturity over an extended growing season – often 15 to 20 percent longer than neighboring areas, while retaining their all-important natural acidity.